Based on a shounen manga by Yagi Norihiro serialised in Monthly Shounen Jump. 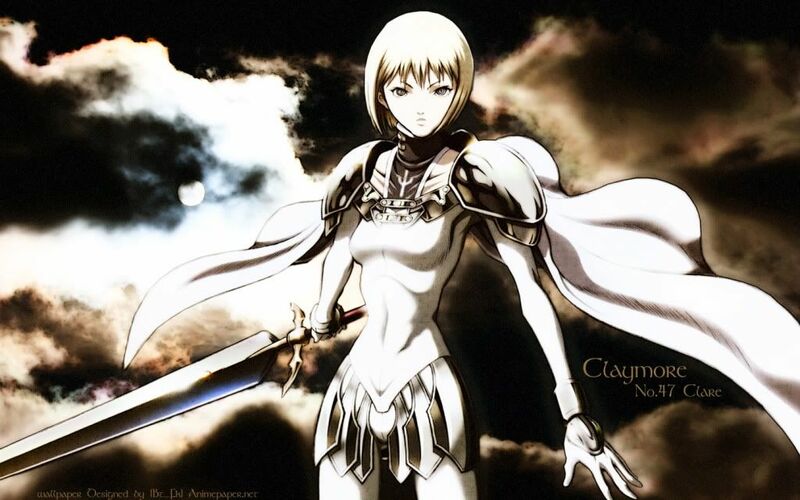 The story of Claymore follows the adventures of the beautiful Claymore warrior Claire, who fights demons and struggles to hold on to her humanity. Long ago, the Yoma, the shape changing demons, took human form to live in disguise among human society. They feed on human innards, and take possession of memories from the brains of people they eat. These acquired memories help them better disguise themselves within human society. In recent years, a secret society discovers a way of implanting demon bodies and body parts into humans, to create hybrids more powerful than the original demons. Hybrid`s standard abilities include faster healing, limited shape modification, the ability to detect other demons and hybrids, and overall enhanced physical prowess. Almost all hybrids are created against their will; they are typically survivors of families attacked by demons. The only exception is the lead character, who volunteered to become a hybrid to avenge her family. The society sends hybrids to towns that can afford their fares to kill demons, although not every hybrid does so willingly (this is implied in the manga.) The society is often strict and harsh; hybrids who break the rules risk being hunted down by their fellow hybrids.